When we go shopping for a certain cosmetic, mineral makeup or skincare product, all we wish to be able to do is discern what sort of cosmetic ingredient we are placing on our skin simply to keep things as healthy as we can, whether it be synthetic, organic and / or natural in nature. How many of us have gone to our local drugstore, picked up one of these items, turned it over, only to discover we need a magnifying glass to read the ingredient label? Is it our eyes or is the text on the product labels shrinking? Is the manufacturer trying to deceive us or hide the mystery ingredient within a crowded list of unreadable text? To add further frustration to our search for what is actually in a product, we then go to that particular company's website only to find they don't offer an ingredient list there either. We finally do get a sense that the manufacturer may be trying to hide the truth of what is in their beauty products. Fortunately, we provide an ingredient list on all of our mineral makeup, skincare and lip color products directly on the packaging. Plus, we take it a step further and provide full ingredient decks under every product and every shade you select on our ingredients tab below the description so you know before you buy in order to avoid an ingredient associated with an allergy you possibly have. It seems as though the ingredient lists are not only getting longer, but the type is getting smaller due to the size of most packaging. It also doesn't help when the ingredient list seems to be written in some sort of foreign language due to FDA regulations. It is in the form of an INCI descriptive. We admit that some of the ingredient names are long and confusing, including some of the botanical and synthetic ingredients you might find on the label. Of course when we can't pronounce something or don't understand it's source, we then may become more curious or scared depending on the perspective or what we may have read on the internet. Some NGO's are working diligently to have many ingredients removed in order to promote a more natural agenda despite the missing science to support the proclamations being made. This is another reason why we choose to only provide our customers with sound science based facts and not propaganda. We also make sure that the required extensive botanical genus INCI name, also shows the generic name in parentheses. After all we don't expect our customers to decipher ingredients either. FDA of Colors and Cosmetics provides many ingredient terms and what is allowed and to be considered safe for cosmetic use. We decided it was important for an update so we could address some concerns. As we head into an era based on a popularity of reducing synthetic chemicals in our skincare, diet, and overall everyday lives, this information is important as more and more of us demand companies disclose what we are using throughout our day. Going Green as much as possible is definitely the wave of our future and we support it in practical terms. 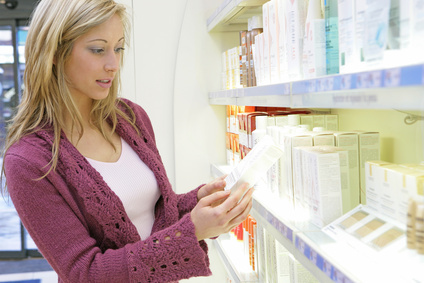 So from that perspective we want you to know that the easiest way to interpret an ingredient label is to understand FDA Regulations for cosmetic labeling. It is simple and concise but can still allow for vagueness in product labeling at times. Ingredients must be listed in descending order in terms of highest ratio to the lowest. They must list an ingredient as “Active” if it is considered an OTC drug. So in other words, a claim is made to treat or cure a condition. Any ingredient used less than 1% can be listed in any order on the label after the main ingredients are listed, or it can be listed as “and other ingredients”. May Contain Ingredients: This is an easy way for the manufacturer to cover their bases without having to get specific with pigments including Titanium Dioxide. Also pigments can be in any order after the main list of ingredients regardless of ratios used. This further explains the non-inclusion of essential oils and preservative, and how the manufacturer can simply leave off the list the individual oils or preservative used, and be noted as "Fragrance". This only leaves the consumer to speculate what is actually in the product. Trade Secret Ingredient: A manufacturer may apply for an allowance of an ingredient to remain confidential to protect their formulations if only the ingredient has been proven to have some benefit to the product that no other company has used or has knowledge of. This can also be categorized as “and other ingredients”. The Incidental Ingredient: Some manufacturers leave off an ingredient based on a misinterpretation of an FDA Description feeling they fall into this category, such as in coated or surface treated minerals or pigments. Actually the FDA is clear on this even though many choose to ignore it! Their ingredient listing should include these coatings since they are used to create an effect on the finished product and aid in the cosmetic performance. FDA Regulation For An incidental ingredient is defined in § 701.3(1) as: Only the rules below apply for not declaring on a label. A substance added during manufacture and removed from the cosmetic in accordance with good manufacturing practices before the cosmetic is packaged in finished form. Example: Filter aid. A substance that is added during manufacture of a cosmetic, is converted to an ingredient declared on the label, and does not significantly increase the concentration of the declared ingredient. Example: Sodium hydroxide added to a sodium stearate and stearic acid-containing cosmetic (Example: for making Soap. Or another Example: Borax combined with Nitrogen to create Boron Nitride.) BN powder would be on the list, not the ingredients that it took to create it. A substance added to a cosmetic during manufacture for its technical effect in processing but present in the finished cosmetic at an insignificant level and not having any technical or functional effect in that cosmetic. Example: De-foaming agent. A substance added to a cosmetic as a component of a cosmetic ingredient and having no technical or functional effect in the finished cosmetic. Example: Preservative of a raw material added to a cosmetic as an ingredient at a concentration which reduces the preservative to a level at which it is no longer effective. Coatings such as Carnauba Wax, Dimethicone, Perfluoroalkyl Phosphate, Lauroyl Lysine, Methicone and Magnesium Myristate to name a few, are commonly used to create better performance to a main mineral ingredient such as Mica, yet are rarely seen on mineral makeup ingredient lists. Or you will see them explained in obscure locations on websites and left off the label altogether. This is what some companies assume is an "incidental ingredient". However, since these coatings are used to enhance the performance of an ingredient used and create an effect within the mineral makeup for better skincare, slippage, adherence, or luminosity, then it would not qualify to be left off of the label. Mineral makeup powders are silken in nature and are not typically creamy, yet you may feel a creamy texture when rubbed between your fingers. Certain oils can be added for a variety of reasons but making a powder feel creamy is not one of them, and the oils can certainly enhance a powders performance and be beneficial to the skin. If a powder has a creamy, almost oily texture then it has been coated with one or more of the ingredients stated above with the exception of bismuth oxychloride since it has a natural component of making a mineral powder feel creamier than the reality. Some of these coatings may or may not cause further problems for the skin. We add Jojoba Oil to our Foundations and Evening Rose Veil to aid in soothing the skin and not irritate or further exacerbate acne, yet it will not change the structure of the mineral powders. What About Ratios Of Mineral Makeup And Skincare Ingredients? Some experts advise to pay attention to the first 3-4 ingredients in a product since this will be the primary ingredients in terms of ratios. This is true to a point. Let's Look At An Example: Titanium Dioxide may be the first ingredient on the list followed by a number of other ingredients. Does this mean Titanium has the highest ratio of overall product? Not necessarily! The same goes for any ingredient that is considered a primary ingredient. The ratio of Titanium could be equal to Mica or Zinc Oxide or any other ingredient on the list. But which one do you list first? This is strictly left to the manufacturer. Another Example: Base powder formulations that consist of a multitude of other minerals and botanicals could be higher in ratio, but the individual ingredient in the base powder has a lower ratio than the primary so it must be listed in descending order. So in descending order Titanium dioxide would be the larger ratio in comparison to all individual powders, yet once combined within the formulation it may actually only be 5-25% of the total mineral cosmetic. Our Best Advice: In lieu of sensitivities and to avoid ruling out the potential of using a great product for the face, when in doubt, contact the manufacturer to have them clarify at what percentage of an ingredient is being used in the overall product. First in line on the ingredient list doesn’t necessarily make this the highest overall ratio in a formulation. In fact, one mineral makeup company where they have received an SPF rating, the ratio of “Active Ingredients” for Titanium Dioxide is 14% and Zinc Oxide is 3-6%. This is very low in terms of a complete formula, yet they must be first on the list due to being declared an OTC. Sensitivity Issues: This is rarely a problem if any ingredient falls in the "less than the one percentile" ratio. But when it comes to fragrances (essential oils) or coatings, wouldn’t you like to know exactly what it is you are applying to your face at all times? We certainly feel it is, especially since many women have sensitive / sun damaged skin, and also experience extreme sensitivity to certain essential oils, so at less than 1% of ratio, if the ratio is that of times 10 or 20 different oils, that can become a huge percentage of allergic reaction. Based on these realistic disclosures, it is why we always make sure all of our ingredients are declared on our product labels and website despite FDA allowances for certain ingredients. So to understand product labels, even in all their clarity of list of ingredients, true ratios are still considered to be vague and are not required to be formally listed in this manner. We sincerely hope this has assisted those that were still not quite sure how labeling works for the cosmetic industry.